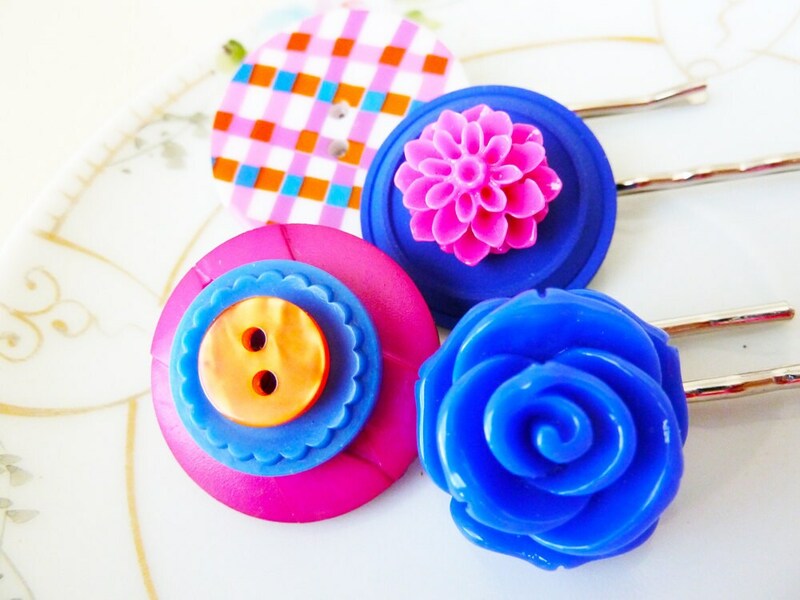 I've taken vintage and new large sewing buttons & flower cabochons to make this pretty floral hair accessories set. The colors are bright and playful orange, blue, and pink. The adornments have been securely affixed to a 2" (5.1cm) silver tone pin with professional grade jewelry epoxy. 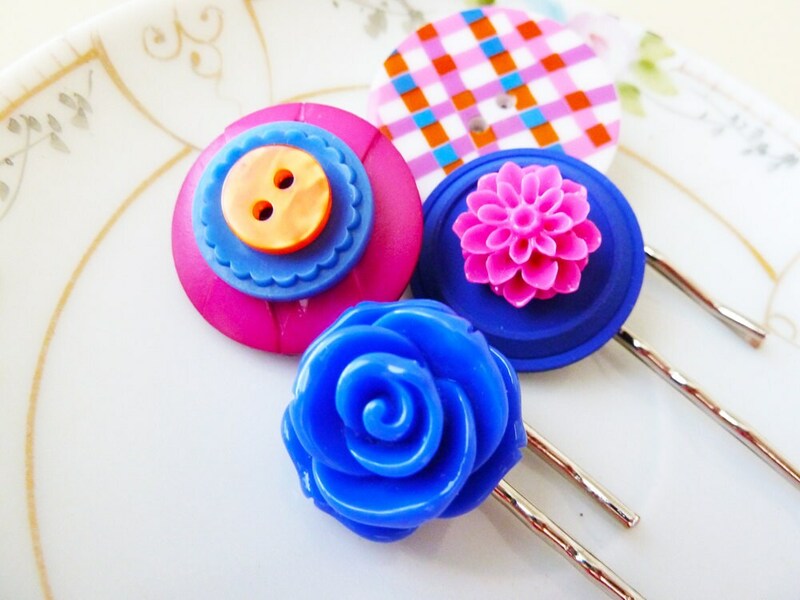 The button adornments measure between 0.75" (19mm) and just over 1.25" (32mm) in diameter. You are purchasing the set of four hair pins you see in the pictures. I accept PayPal, Etsy Direct Checkout and Etsy Gift Cards. PLEASE READ - YOU WILL NOT RECEIVE YOUR ORDER ON TIME FOR CHRISTMAS IF YOU ORDER AFTER 12/16/18. PLEASE NOTE: If you purchased before realizing your package would not arrive in time for Christmas, I'm happy to issue a full refund and cancel your sale. Please convo me & I will refund asap. Please note that all stud earrings are MADE TO ORDER so I will need up to 72 hours (3 days) to make the earrings prior to actually shipping them. I ship packages via USPS mail using the least expensive method as determined by weight. I ship Monday through Friday and am usually able to get ready to ship items out within 24 hours of purchase but guarantee within 3 days of purchase. I offer flat rate shipping for domestic buyers. You are charged the rate for the heaviest item & the rest will be charged at $0. International customers are responsible for all fees, taxes, and duties associated with shipping to their respective countries as this is not included in the cost/shipping. The cost for me to ship internationally dramatically increased in early 2016. This is unfortunate and heart breaking for me, but I am not able to control the pricing scheme of the USPS. I now only offer international shipping by request. I apologize for the inconvenience, but I need to make sure that you understand the costs associated with shipping to your country. I want you to be absolutely delighted by shopping at KreatedbyKelly. If, for any reason, you are not satisfied with your purchase, please contact me so we can discuss a favorable resolution. I am a registered business in Indiana and the sole proprietor of KreatedbyKelly so I have to collect the 7% sales tax on your item. I am happy to arrange for local pick up in the Brownsburg/Indianapolis area. Please convo me if you want to do that rather than pay for shipping. Updated 12/16/17: It's TOO LATE to get your package by Christmas so from now until 12/25/2017, I wanted to throw some holiday cheer your way by giving you 15% off your purchase price. Merry Christmas!!! Can you make these earrings as clip ons? I probably can! 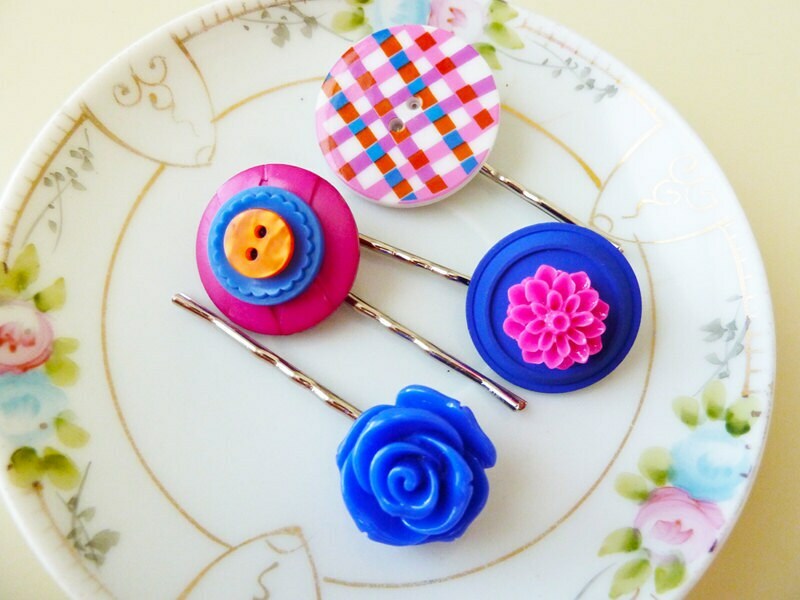 Most earrings can be reworked into clip ons. Those that cannot, I can try to make something similar. Please use the "ask a question" button from the listing to start the conversation. Do you have these stud earrings in a smaller size or a different color? I just might! Please use the "ask a question" button from the listing to start a conversation with me. Upon request, I am happy to do so. Please understand I stopped offering international shipping due to the excessive cost. Not only is it expensive, but any VAT or fees imposed by your country are not included in the shipping / handling cost. Please use the "ask a question" button from the listing to contact me to talk to me about international shipping. I just need to know which listing(s) you are interested in so that I can give you a shipping quote & we can go from there. Thank you so much for your interest! Stud earrings are water resistant, but not waterproof - you should remove your studs before bathing or swimming. Stud earrings should not be slept in. Excessive heat and moisture may affect the adhesive bond. This does not mean you cannot wear them on hot days, but leaving them in a car on a hot day may weaken the bond over time. All jewelry will come to you in a jewelry box sized appropriately for the item (i.e. bracelet boxes for bracelets, small kraft boxes for stud earrings, etc.). If you are purchasing multiple pairs of studs for yourself, I can package in a way to ship in one box (better for the environment :) ). Just leave a note to seller if you don't need individual boxes for multiple pair purchases. Please note: All stud earrings are MADE TO ORDER so please allow up to 72 hours for me to make your earrings prior to shipping. Once the package ships, standard shipping times apply. This is a gift, will you include a note with the package? Absolutely! I'm happy to write a special little note for you. Please include a "note to seller" at checkout with what you would like the note to say.